Elizabeth Streeter has been writing professionally since 2000. She specializes in subjects ranging from how to live a happier life to potentially harmful food and drug-related interactions. Streeter has written for "Family Circle," "Woman's Day," "Natural Health" and "Fitness." Streeter holds a Bachelor of Science in nutrition science from Auburn University and is currently working towards a Master of Arts in psychology. If you’re one of the 50 million Americans with hypertension, you may be a little hesitant to undertake a running program, but there's no need. Exercise can actually help you control high blood pressure without the use of additional medication. Running, along with other exercises, may lower diastolic and systolic blood pressure readings by as much as seven points, states the American College of Sports Medicine. Because of your preexisting condition, however, you should take some precautions. 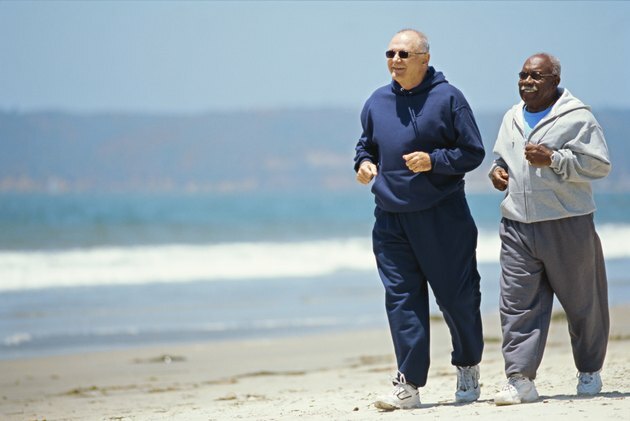 Visit a physician or health care provider for clearance before starting a running program. Hypertension puts you at risk of other conditions that may influence your response to exercise. In addition, some medications have side effects that interfere with running, such as elevated heart rates. Your health care provider can provide insight into your condition as well as ways to cope with any potential problems. Warm up for at least 10 minutes before starting exercise, recommends the American Heart Association. This gives your body time to adjust to the demands of running. You can warm up by walking or marching in place. Run at least 30 minutes at a moderate intensity for best results. The American College of Sports Medicine states that this amount of moderate-intensity activity is enough to lower your blood pressure, and works just as well as vigorous exercise. If you're performing at a moderate pace, you will be breathing quickly but not be out of breath. Take walk breaks. If you find yourself out of breath, run one minute then walk four minutes. Decrease the walk breaks by one minute, as your fitness progresses. It can take a while before you're able to run comfortably the entire 30 minutes. Be patient. Cool down with a walk. Abruptly stopping a working can cause blood pressure to plummet. This may cause dizziness and cramping. Run at least three times a week. If you're fit enough, exercise up to six days per week to see greater improvement, suggests Brad A. Roy, Ph.D., executive director at Summit Medical Fitness Center in Kalispell, Montana. Some people see their blood pressure readings drop in as little as three weeks, notes the American College of Sports Medicine.